The usual route into a career in hydrogeology is to obtain an MSc or PhD qualification in Hydrogeology. These courses provide a firm foundation in hydrogeological knowledge, and are now a pre-requisite for most employment in Hydrogeology. Helen Bonsor, BGS © NERC 2012. A third MSc Hydrogeology course is due to start at Strathclyde University, Glasgow in 2012/13. 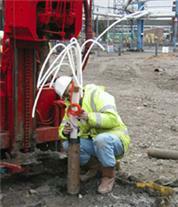 There are many other MSc courses in the UK which include some groundwater training. Most are environmental science courses which contain only one or two modules of groundwater science. However, there are a few, which are listed below, that provide significantly more groundwater teaching, and can provide a good background in hydrogeology. For all courses, applicants will need a first or second class degree in a relevant subject area. Sometimes evidence of mathematics training, usually to A level standard or equivalent, is required, as well as evidence of an adequate standard of English for those not from the UK. In the past the Natural Environment Research Council (NERC) has provided studentships to some MSc courses, but from 2011/12 entry, NERC studentships have been withdrawn from all UK MSc courses. Individual University departments will be able to advise if any other funding may be available. International students may gain funding through overseas research scholarships, Commonwealth scholarships or through their home government. 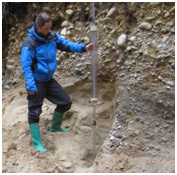 For people already employed in general environmental work, it is sometimes possible to gain sponsorship from employment to undertake a Hydrogeology MSc course full- or part-time. Alternatively, a company maybe unable to sponsor an employee, but will be willing to guarantee employment on completion of the MSc.